Inclusion of stakeholder voices in the allocation of research funding can increase the relevance of results and improve community engagement in research. We describe the results of an online survey that gathered input from community stakeholders regarding autism research priorities. A demographically diverse sample of respondents (N = 6004; 79.1% female; 72.5% ages 30–59; 86.4% USA) completed the survey. Results indicated a preference for applied relative to basic science topics, though both basic and applied science areas were rated as important. Respondents gave their highest ratings to research focused on co-occurring conditions, health and well-being, adult transition, and lifespan issues. These results can guide decision-making by public and private funders when developing science funding priorities and engaging in science dissemination activities. [Findings suggest] that the majority of the autism community, including the majority of people with autism,recognizes the value of basic and translational science for driving toward understanding and generating more powerful interventions for the future. The major exception was animal models, which generally received low priority ratings, even among the researchers who completed the survey. This finding deserves more attention, and funders who regularly support animal work may benefit from greater attention to helping stakeholders understand the potential value of this work. Regardless, the slightly lower overall ratings for basic science suggest a continual need to communicate the importance of early stage basic science projects as drivers of future innovation in applied research. The U.S. Department of Education is delaying, by two years, implementation of a rule that would require states to take a closer look at how school districts identify and serve minority students with disabilities. The "Equity in IDEA" rule, issued by the Obama administration in December 2016, would have gone into effect for the 2018-19 school year. It created a new process for states to follow when they monitor how districts identify minority students for special education, discipline them, or place them in restrictive classroom settings. The Individuals with Disabilities in Education Act requires this monitoring. Districts found to have "significant disproportionality" in one or more of these areas must set aside 15 percent of their federal special education funding to spend on remedies. In The Politics of Autism, I write that autism parents must be advocates for their children, who in turn must grow up to be advocates for themselves. Most graduates of the Partners in Policymaking class are the mothers of young children with developmental disabilities. They've been meeting at this hotel one weekend a month for eight months. They learned how to fight for their child in school, and how to push for health care their child needs. But also, how to read a state budget, how to talk to a state lawmaker and how to testify before the school board or city council. There are 5.2 million children with developmental disabilities in America. That's according to Sheryl Larson, of the Institute on Community Integration at the University of Minnesota and the senior researcher of an annual report on services for people with developmental disabilities. Partners in Policymaking is available not just in Minnesota. Currently, 29 states and the District of Columbia run classes. Since it started in 1987, the total number of graduates has grown to more than 27,000. The graduates are the parents — almost always mothers — of a young child with a developmental disability. Or they're an adult with a disability. It's not unusual that a parent takes the class first, then the kid grows up and takes the class, too. Those are stories Colleen Wieck wants parents to tell. She started Partners in Policymaking in 1987. At a Senate hearing in Washington on cuts to Medicaid, Wieck watched a parent struggle to tell her story — and got the idea to train parents. "One story can make a difference," says Wieck, who runs the Minnesota Governor's Council on Developmental Disabilities, which sponsors the program. "And we teach people, you owe it to the world to tell your story. You have a story. You tell it. It could change public policy." Jillian Nelson is the first person parents talk to when they call the Autism Society of Minnesota, often because their child just got a diagnosis of autism. "The underlying message that I always give people is, 'You're going to be okay. ... Your kid's life may be different than you ever imagined, but it's still going to be a good life and everything's going to be okay." Nelson is an adult with autism. Several US “hotspot” metropolitan areas stand out for their very large numbers of NMEs. They include Seattle, WA, Spokane, WA, and Portland, OR in the Northwest; Phoenix, AZ, Salt Lake City, UT, Provo, UT, Houston, TX, Fort Worth, TX, Plano, TX, and Austin, TX in the Southwest; Troy, MI, Warren, MI, Detroit, MI, and Kansas City, MO in the Midwest; and Pittsburgh, PA in the Northeast. Additional smaller counties—especially in ID, WI, and UT—also stand out for their high exemption rates. We analyzed the relationship between NME rates and actual vaccine coverage, and found an inverse association between NME rate and measles, mumps, and rubella (MMR) vaccine coverage of kindergarteners in these states (P = 0.03 by Spearman correlation), indicating that states with higher overall NME rates do in fact have lower MMR vaccine coverage (P = 0.007 by beta regression). Our findings indicate that new foci of antivaccine activities are being established in major metropolitan areas, rendering select cities vulnerable for vaccination-preventable diseases. As noted by the recent experience in Anaheim, California, low vaccination rates resulted in a measles outbreak. In contrast, state closure of NMEs has resulted in an increase of MMR coverage. In The Politics of Autism, I explain how the issue connects with so many other issues. Immigration is an example. At Kaiser Health News, Ashley Lopez reports on immigrant families opting out of health services. Health care groups say they’ve observed other immigrant families making similar choices, and they think it will accelerate if a proposed change to green card eligibility becomes law. Under the proposed change, if family members receive government services — even if those family members are citizens — it would ding the applicants’ chances of approval for permanent residency. “We are seeing families having to make this impossible choice,” said Maria Hernandez, the founder of Vela, a nonprofit in Austin that helps parents who have children with disabilities. In the first year of the Trump administration, Central Texas experienced an uptick in immigration raids and deportations. Since then, Hernandez said, a lot of people in the immigrant community have been making critical choices out of fear. “We know that that is not a good plan for kids that for forever have been followed by a neurologist because they have seizures or have been going to occupational therapy for years and are finally making progress,” she said. Media advisory: To contact corresponding author Anny H. Xiang, Ph.D., email Elita Fielder at Elita.T.Fielder@kp.org. The full study is available on the For The Media website. Translation available: A translation in simplified Chinese is available below. Editor’s Note: This study is being presented at the American Diabetes Association’s 78th Scientific Sessions. Please see the article for additional information, including other authors, author contributions and affiliations, financial disclosures, funding and support, etc. For more information, contact JAMA Network Media Relations at 312-464-JAMA (5262) or emailmediarelations@jamanetwork.org. In The Politics of Autism, I point out that there is currently no commercially-available blood test for autism. That situation may change someday. Instead of looking for one single chemical to measure, the researchers — led by Prof. Juergen Hahn — used a big data approach and searched for patterns in metabolites. In 2017, the researchers had their first success. They analyzed blood from 149 people with an ASD diagnosis, assessing each sample for levels of 24 metabolites. The chemicals were all related to two particular cellular pathways: the methionine cycle, and the transsulfuration pathway. Having done this, they scientists were able to create a test that could correctly identify more than 96 percent of ASD cases within the group that they had recruited. Recently, the same team set out to replicate its findings in a new dataset. They assessed data from 154 children with ASD, taken by researchers from the Arkansas Children's Research Institute in Little Rock. This time, however, they only had access to information on 22 of the 24 metabolic markers they had used in the last trial. Their results were published this month in the journal Bioengineering and Translational Medicine,and they are encouraging. When they applied the algorithm, it predicted ASD correctly in 88 percent of cases. While 88 percent is an impressive result, it is lower than the success rate from the previous studies. Prof. Hahn thinks that this is because the two missing metabolites were shown to be strong indicators in the last study. However, the results are still exciting. As always with autism, caution is in order. For decades, ASD people and their families have read of medical breakthroughs, only to meet with disappointment as more studies come in. Social interaction and communication skills can be a challenge for people with autism spectrum disorder, but companies looking to hire untapped talent for tech-related jobs are discovering that those with autism are unusually detail-oriented, highly analytical, and able to focus intensely on tasks, making them valuable employees. Last October, six companies—Ford Motor, DXC Technology, EY, Microsoft, JPMorgan Chase, and SAP—formed the Autism at Work Employer Roundtable to share best hiring and workplace practices and to help other companies see the return on investment in hiring autistic employees. School districts have built-in expert witnesses in the form of teachers and staff. They also have full access to all relevant information about a proposed placement, and often deny parents access to those programs in advance of hearings. When parents’ experts can observe children in class, districts can limit their observations. More important, parents have to foot the bill for their experts because of a 2006 Supreme Court decision that IDEA does not authorize reimbursement of witness fees. “While authorizing the award of reasonable attorney's fees, the Act contains detailed provisions that are designed to ensure that such awards are indeed reasonable,” Justice Alito wrote for the majority. “The absence of any comparable provisions relating to expert fees strongly suggests that recovery of expert fees is not authorized.” It goes without saying that this decision disadvantages all parents, and especially those with modest incomes. The conventional wisdom is that any kind of treatment is likely to be less effective as the child gets older, so parents of autistic children usually believe that they are working against the clock. They will not be satisfied with the ambiguities surrounding ABA, nor will they want to wait for some future research finding that might slightly increase its effectiveness. They want results now. Because there are no scientifically-validated drugs for the core symptoms of autism, they look outside the boundaries of mainstream medicine and FDA approval. Studies have found that anywhere from 28 to 54 percent of autistic children receive “complementary and alternative medicine” (CAM), and these numbers probably understate CAM usage. Although Brain Balance isn't the only purveyor of alternative approaches for developmental disorders in the U.S., the scale of the enterprise sets it apart. The company's approach is still relatively new and not widely known, meaning many experts in the field of childhood development have not vetted its effectiveness. Brain Balance says its nonmedical and drug-free program helps children who struggle with ADHD, autism spectrum disorders and learning and processing disorders. The company says it addresses a child's challenges with a combination of physical exercises, nutritional guidance and academic training. Yet a dozen experts in autism spectrum disorder, ADHD, dyslexia and childhood psychiatry interviewed by NPR all identified flaws in Brain Balance's approach. They said the company's idea of imbalanced hemispheres was too simplistic and built upon the popular, discredited myth of the logical left brain and the intuitive right brain. "It doesn't make sense," says Mark Mahone, a pediatric neuropsychologist at the Kennedy Krieger Institute in Baltimore. "In virtually every activity that one does ... both hemispheres of the brain are very, very active. ... It's not as simple as just being a left- or a right-hemisphere problem. Nothing is that simple." As for the three-pronged Brain Balance regimen, experts NPR spoke with said there is no solid evidence suggesting gluten, dairy or sugar consumption affects ADHD, autism or dyslexia. And although physical exercise may have modest impacts on inattention and tutoring can help in school, these interventions can be found elsewhere for much less money. No expert suggested either as a front-line remedy for ADHD or autism. Autism services has already been an attractive industry for investors, particularly those looking to make a positive social impact. For such investors, the industry provides a very favorable opportunity for financial gains with the added benefit of empowering a growing segment of the population in need of support. In the past five years, the market has become increasingly consolidated. As private equity eyes the increase in demand along with a more favorable climate for funding and reimbursement, we can expect to see even more consolidation in the future. As investors build national platforms by acquiring providers, these new national platforms are competing for dominance, and making it more difficult for privately owned companies to compete. A benefit of this new landscape is that competition can raise the bar of service for any market. However, in healthcare especially, consolidation often stymies competition. By buying up a significant share of the market, larger players are able to effectively increase their bargaining power with insurers and suppliers. This gives them an outsized advantage over their competitors. That kind of market dominance prevents real competition and thus fails to improve quality. This is also why research shows that consolidation in healthcare typically leads to higher prices. [B]ehavior analysts in Kansas can’t keep up with demand. A big reason, they say, is the state’s privatized Medicaid program, KanCare. Reimbursements are too slow — and too low. One well-established mental health center recently decided to add ABA therapy to its services, but for now, at least, won’t be accepting Medicaid for that program. Even the process of getting credentials from KanCare’s three contractors can take months for each therapist. In the meantime, applicants for those jobs sometimes disappear. IBT, which serves large parts of Kansas, currently serves about 60 children. It has about 150 on its waitlist for behavior analysis. Most are enrolled in KanCare, which insures children based on family income and level of need. It can take a long time for slots to open up because therapy for a single child can take multiple years. Total civilian noninstitutionalized population with a disability in the United States. The percentage of the civilian noninstitutionalized population in West Virginia in 2016 with a disability — among the highest rates in the nation. Utah, at 9.9 percent, had the lowest rate. 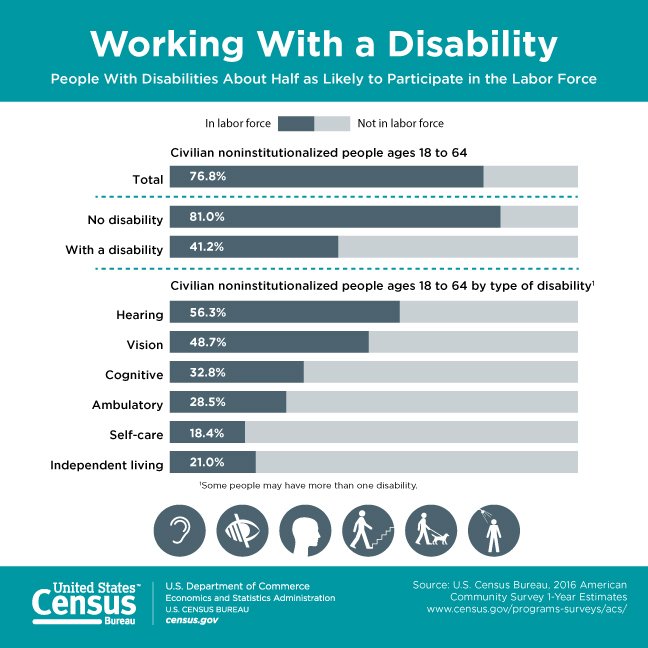 Total civilian noninstitutionalized population ages 18 to 64 employed with a disability. Median earnings in the past 12 months (in 2016 inflation adjusted dollars) of the civilian noninstitutionalized population age 16 and over with earnings and a disability. In The Politics of Autism, I discuss the need for more study of the issue in other countries. Since autism was first recognised, prevalence has increased rapidly. The growing economic as well as social cost to families and society can only be mitigated by effective interventions and supports. It is, therefore, not surprising that there is much heated debate and most governments have developed public policies to address the management of autism. This paper describes how well-known ‘propaganda’ techniques, that have become prevalent in the helping professions have been used to influence autism policies by spreading ‘fake news’ about the scientific discipline of Applied Behaviour Analysis (ABA). Over the past 40–50 years, meaningful evidence has accrued showing that interventions based on ABA can help people with autism reach their potential. In view of this, nearly all of North America has laws to mandate that ABA-based interventions are available through their health care systems. In contrast, across Europe there are no such laws. In fact, the National Institute for Health and Care Excellence (NICE), the body guiding health and social policy in the UK, concluded that it could not find any evidence to support ABA, and therefore could not recommend it. This paper addresses the reasons for these diametrically opposed perspectives. Students registered with the DSO at a public university in the eastern region of the U.S. were surveyed about their preparation for college, their experiences and perspectives of services received, and perceptions of family involvement in college. Participants’ sense of preparedness for college ranged from feeling very prepared (25%) to very unprepared (10%). They cited specific transition skills such as timemanagement, note taking, and writing as having positive impact on their academic preparedness for college. However, participants noted that they would have benefited from more explicit instruction in executive functioning, as well as study and literacy skills prior to college. Participants also reported that they would have benefited from specific instruction on the logistics of college life prior to high school graduation, including how to select and register for courses, communicate appropriately with professors, budget money, and navigate the college environment. These needs support previous findings by Cai and Richdale (2016), suggesting that Individualized Education Program (IEP) teams should support high school students in identifying their personal strengths, needs, as well as available resources to access in college. The ranks of students receiving services for autism continue to grow. In The Politics of Autism, I discuss challenges facing autistic adults and children. One is stereotyping of autistic people. Autism stereotypes can often portray autistic people in a negative way. However, few studies have looked at how autistic people think they are perceived by others, and none have specifically asked autistic people what they think the autistic stereotypes are. Semi-structured interviews with 12 autistic adults (aged between 20 and 63 years) were conducted. Using interpretative phenomenological analysis, three main themes emerged from the data. These were as follows: (1) the primary stereotype is that autistic people are ‘weird’; (2) autistic stereotypes have negative effects and consequences; and (3) autistic people are heterogeneous. This study makes an important and novel contribution to understanding the experience of being autistic by exploring how autistic people feel they are perceived by others and identifying some of the ways in which negative stereotypes are believed to have negative consequences for autistic people. The idea of representation was a central focus of this year's Drama Showrunner Roundtable for the 2018 Emmys season, with creators of The Chi, Power, The Looming Tower and The Handmaid's Tale centering their discussions on how they tell stories of race, ethnicity, religion and gender. David Shore, creator of The Good Doctor — a hospital drama in which the central character has autism —explained his perspective on writing for Freddie Highmore's autistic character. Shore said having a main character with autism is "not something we see very much." He posed to the Roundtable, "How do I make him fully dimentionalized while being true to people with this condition or on this spectrum? While at the same time, he's representing that condition." "It's important that I don't turn him into the magic person with autism," Shore told The Hollywood Reporter. "It's important that I be true to his weaknesses and his strengths. It continues to be a challenge." At High Times, Adam Drury reports on Colorado Governor John Hickenlooper (D) vetoing legislation that would have allowed the use of medical marijuana for autism. Of the 30 states (and D.C.) that have legalized medical cannabis, only 5 consider autism spectrum disorder a qualifying condition. Colorado was poised to become the sixth. But bi-partisan support for the measure was not enough to convince Gov. Hickenlooper to sign the bill. HB 1263 passed the Colorado Senate with a 32-3 majority. The House voted 54-7 in favor of the bill. But that, and MAMMA’s vocal presence in the capitol Tuesday didn’t sway Hickenlooper. He says other autism advocates and support groups failed to turn out for (or against) the bill. “Their neutrality speaks volumes,” Hickenlooper said in his office. The governor also said he hadn’t received any support for the autism measure from certified pediatricians. “I’m sure they’re out there, but I haven’t found a pediatrician yet who thinks it’s a good idea to sign this bill,” Hickenlooper said. Additionally, an executive order will be issued directing CDPHE, in coordination with the Board of Health, to evaluate the safety and efficacy of medical marijuana for the treatment of autism spectrum disorders in children. Gov. John Hickenlooper today signed a letter of support for the “Strengthening the Tenth Amendment Through Entrusting States Act” proposed by Senators Cory Gardner and Elizabeth Warren. This legislation would allow states to adequately regulate their marijuana industries without intervention from the federal government. "The federal government needs to provide states adequate space to self govern,” said Governor John Hickenlooper. “The issue can no longer be avoided. Ultimately, collaboration with the states will prove critical as the federal government begins to engage on cannabis issues." You can view the entire letter here.